The Black-bellied Plover is one of the most wide ranging of the shorebirds, breeding in the high Arctic of North America and Eurasia, and wintering primarily on coastlines in temperate and tropical latitudes around both the Atlantic and Pacific Oceans, including Hawaii and the Galapagos Islands. It is an uncommon spring and fall migrant in Tennessee. Description: Adult breeding male plumage is nearly unmistakable with the face, throat, breast and upper belly solid black, bordered by a bright white stripe. The back and wings are gray-brown, variably barred with black and the lower belly and undertail coverts are white. Females may look similar to the male or may be more muted and splotchy in color. In flight the "armpits" are black. Nonbreeding plumage is dramatically different from breeding plumage. The head, upper breast, and back are gray-brown with the belly and undertail coverts white. Various levels of barring or streaking may be present, especially as birds are molting into winter plumage. The armpits in flight remain black. Immature birds are similar to winter adults, but have a heavily streaked breast and sides, and a complex pattern of pale dots on upperparts. Very young birds may be washed with golden brown. Voice: Flight call is a distinctive high, clear whistle. The melancholy call resembles PLEE-ooee or peeoo-EEE. American Golden Plover in breeding plumage has golden hue to the crown and wings. It also has solid black undertail feathers. The breeding female Golden-Plovers have some white feathers mixed in on the flanks and undertail. Winter plumage birds have a more distinct white eye stripe and sparsely marked underparts. Immature birds have a spangled back, small head and bill, and barred underparts (rather than streaking). American Golden Plovers never have black armpits. Habitat: Found on sandbars, mudflats, and edges of lakes and ponds. Diet: Insects are the primary food on the breeding grounds. Invertebrates, primarily polychaetes worms, bivalves, and crustaceans, are main foods on wintering grounds. 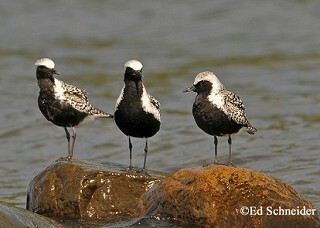 Nesting and reproduction: The Black-bellied Plover have never been recorded nesting in Tennessee. Status in Tennessee: Uncommon migrant in spring and fall. Typically found from mid-March though May and mid-July through mid-November. Populations are relatively stable rangewide. The large eyes on the Black-bellied Plover allow nocturnal foraging, which is a fairly common behavior. These plovers are nervous and quick to give alarm calls. This behavior allowed the Black-bellied Plover to avoid the market hunters of a century ago that decimated shorebirds of similar size. Although these birds may be more sensitive to disturbance than many other birds because they are especially wary, no evidence exists for desertion of the nest or roost sites because of disturbance. Best places to see in Tennessee: Although never predictable, regular spring and fall locations include the Pace Point and other areas on Kentucky Lake at the Tennessee NWR, and Ensley Bottoms in Memphis. Paulson, D. 1995. 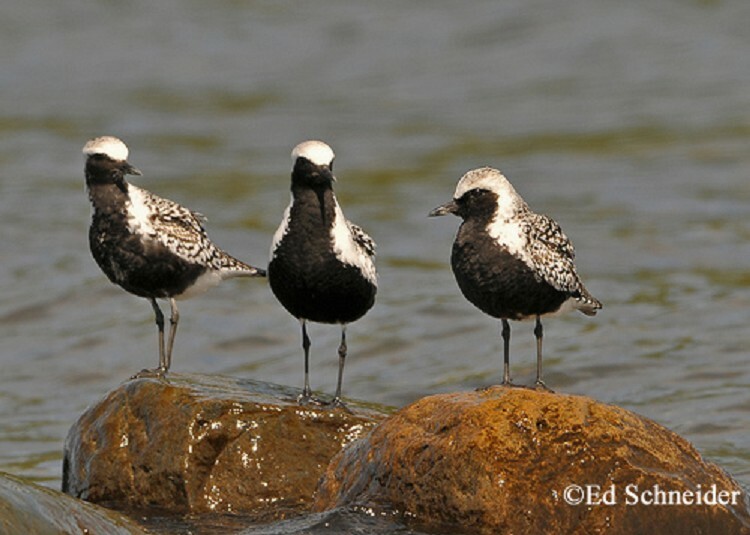 Black-bellied Plover (Pluvialis squatarola), The Birds of North America Online No. 186 (A. Poole and F. Gill, eds.). The Academy of Natural Sciences, Philadelphia, and The American Ornithologists Union, Washington, D.C.